I also believe that by talking about the realities of miscarriage we, as a society, take away the myths and secrecy that surrounds it. Miscarriage can happen for a variety of reasons both known and unknown. Some of the known reasons for a loss include: a fatal genetic disorder, maternal age and health, specific traumas, and abnormalities of the uterus. When considering maternal age and health there are specific lifestyle habits that are known contributors to miscarriage, such as smoking and recreational drug use. By working with your health care providers, you can undergo testing and develop strategies to support upcoming pregnancies. 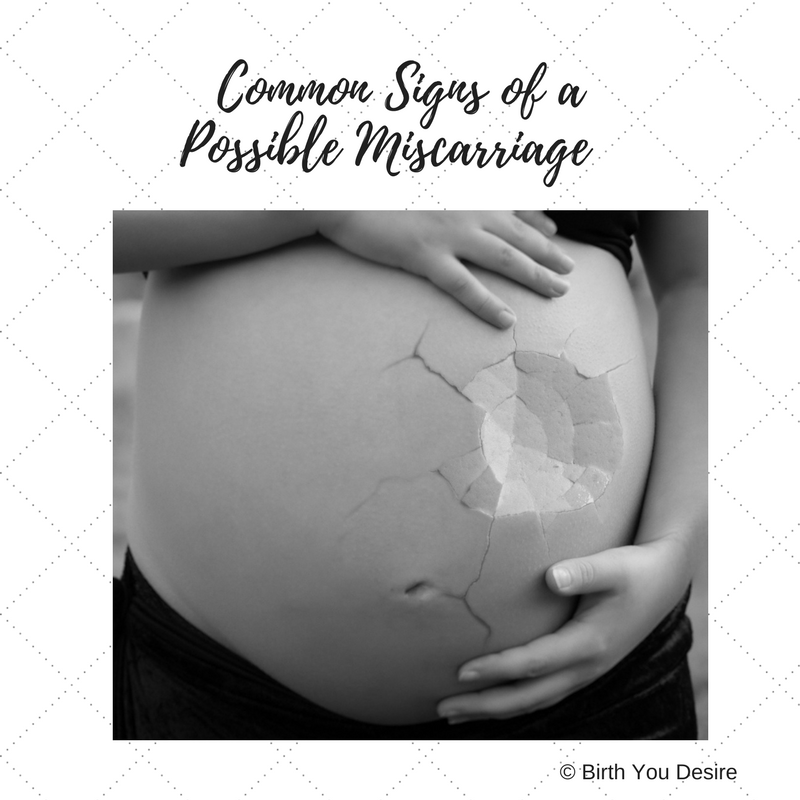 With that said, there are some signs of a potential miscarriage that everyone should know. Abnormal vaginal bleeding– The key word here is abnormal. Up to 20% of all pregnancies will have some form of bleeding in the first trimester. Most of these will continue to have a healthy pregnancy and birth. However, if you experience any dark or heavy bleeding you should check in with your provider. Severe cramping– Cramping when combined with another symptom of miscarriage can be an accurate indicator of a potential loss. For example: cramping combined with bleeding is noteworthy. It is normal to experience some cramping in pregnancy as the uterus and cervix move and change shape, or as the baby changes positions but severe cramping should be checked out. Falling hCG levels– It is standard to test for human chorionic gonadotropin (hCG) as early as 11 days after conception. Your provider will order this test twice, three days apart. The hCG numbers doubles every three days, usually peak around 8-12 weeks, and then decline to a normal level for the rest of the pregnancy. When the numbers drop over three days in the first trimester, most providers will explain that this usually means an impending loss. However not all pregnancies with dropping hCG levels end in miscarriage and some continue on to be full term pregnancies. Unusual Ultrasound reports– The first routine ultrasound is usually around 10-12 weeks. Ultrasound can reliably diagnose a miscarriage when a heartbeat is not noted or there is no growth in the sac. However, ultrasound should not be considered a gold standard for diagnosis and should not be performed routinely to confirm a loss or to confirm life. Passing tissue vaginally– Vaginal discharge is normal in pregnancy and the amount varies with each individual. However, when the discharge is significant or accompanied by clots, you should call your health care provider. As in labor where there is no one true sign of labor there is no one true sign of a miscarriage, the same is true with miscarriage. It is usually a combination of events or symptoms. However, if you are ever concerned about any symptom, you should call your provider.